We own 3 cottages at this location each unit is slightly different but all share the same great view of St Austell Bay. This unit is FAIRWAYS EDGE and is mid terrace. The units can be rent singularly or together thereby allowing families to be on holiday together but having some privacy within each unit. We have owned these cottages for nearly 10 years and we still marvel at the super sea view every time we visit. It is what convinced us to purchase in the first place. The beds will be made up to your requirements with all lined provided. We ask guets to bring their own beach towels. Open plan lounge / kitchen / dinning area situated on the front of the property with the super sea view. Patio doors for easy access to outside table & Chairs to enjoy the view. The kitchen is fully equipped and is open plan with the lounge / dinning area. Situated on Porthpean Golf Course, where weekly golf is available at a reduced rate for guests. Carlyon Bay Golf course is just 5 minutes drive and St Austell golf course within 10 minutes drive. We own 3 cottages at this location each unit is slightly different but all share the same great view of St Austell Bay. This unit is FAIRWAYS EDGE It is mid terrace. The living accommodation is down staits the bedrooms are upstairs. The open plan lounge, kitchen dinner is on the front which gives you the super sea view. A 5th person can be accomodated on a put you up bed which is used in one of the bedrooms when needed otherwise stored away. The property has full central heating when needed. 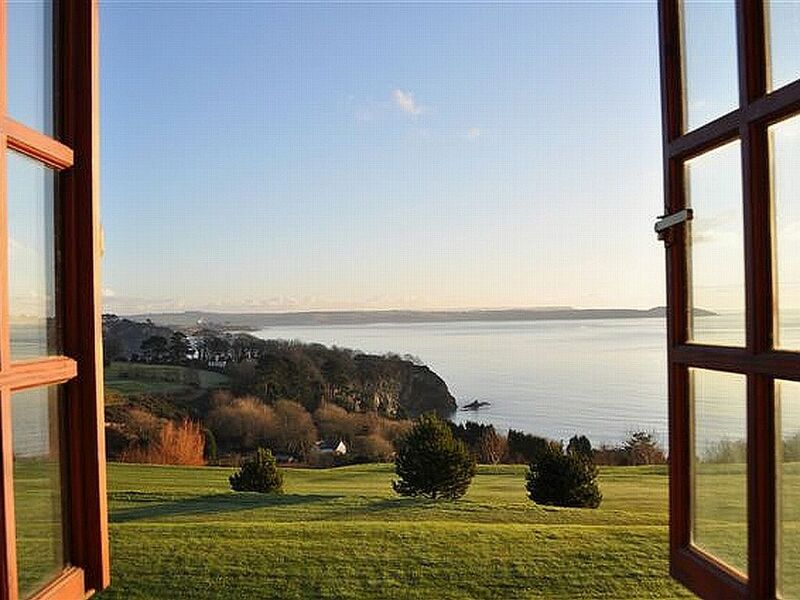 Outside: Outside on the patio area which has views over the golf course and out to sea, the property has a table and 4 chairs from which to sit and enjoy the view over St Austell Bay and Porthpean Golf Course or watch the golfers on the course. The cottages sit adjacent to the 17th hole of Porthpean Golf Course thereby giving easy access to the club house. The course is an eighteen hole and is built around the cottages and the club house is a short walk away where the golf is exceedingly reasonably priced and you can also enjoy a meal, coffee or drink! Porthpean beach has a café in summer and sailing club is within 5 minutes walk. The Southwest costal footpath can be accessed within 50 yards of the property and walks along this footpath offer breath taking views across the bay. Charlestown has real community spirit with its own regatta week in the summer and various other events happening throughout the year such as a Boxing Day charity swim! Charlestown is perfectly situated on the south coast to explore Cornwall. The picturesque fishing harbours of Mevagissey and Fowey are only 15min drive away which are home to some stunning coastal walks. The Lost Gardens of Heligan is also only 15min drive away or a 40 min bike ride along the National Cycle Network route 3 and the Cornish Way trail (mountain bike is recommended!). Other great attractions further west such as St Michael's Mount, The Tate St Ives and the National Maritime Museum in Falmouth are all easily visited in one day. The Eden Project is just to the east of St Austell, Just 3 miles away it is a great educational day out for kids. The Lost Gardens of Heligan is short drive to the south west, the picturesque Roseland Peninsula with its quaint fishing villages is within half an hour's drive and Newquay's vibrant surfing lifestyle and golden beaches are a similar distance to the north. Newquay is the nearest airport while the citys of Plymouth and Exeter are within 1-2 hour drive. St Austell railway station is a major stop on the main London to Penzance line. Use of car is recommended. Two main supermarkets are within 1 mile, whilst polkyth Leisure Centre has an indoor swimming pool, gym, squash courts and sports hall.